Four Argentine survivors of a terrorist truck rampage in New York City say they will always carry the pain of seeing five of their friends killed. The survivors of Tuesday’s attack gathered Friday at the Argentine Consulate in New York. Survivor Guillermo Banchini spoke for the group in Spanish, saying love will continue to unite them and their fallen friends. The four belonged to a group of 10 friends who came to New York last week to celebrate the 30th anniversary of their high school graduation. Five of them died after an attacker steered a truck onto a Manhattan bike path. Three other people also died. 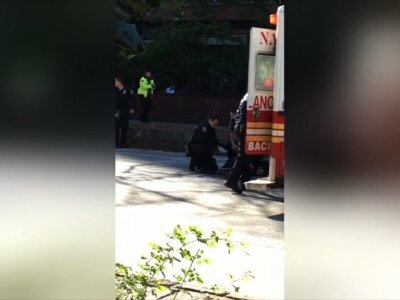 Authorities say Sayfullo Saipov was shot by a police officer after crashing the truck into a school bus. He survived and has been charged. Funeral plans have been announced for the New Jersey man who was among eight killed in a truck driver’s rampage on a New York City bike path. The visitation for Darren Drake will be held Saturday afternoon in New Milford. He will be buried Monday morning. The 32-year-old project manager for Moody’s Investors Service at the World Trade Center was out for a bike ride between meetings Tuesday when the truck hit and killed him. His father, James Drake, says that he drove Darren every day to the train terminal in suburban Hoboken so he could commute to his job in the city. The family of a Boston-area man seriously injured in the New York City bike path attack says he’s expected to make a full recovery. Martin (mahr-TEEN’) Marro’s family said in a statement Friday he’s been receiving “terrific care” at the hospital since the Tuesday attack that killed eight people. The dead include five of Marro’s high school classmates who had come to the U.S. from Argentina to celebrate the 30th anniversary of their graduation. The family didn’t disclose the extent of Marro’s injuries or when he might be released, but they say they are “extremely thankful” for the outpouring of concern from friends, colleagues and the community. Co-workers at Novartis, the Swiss pharmaceutical company where Marro works as a scientist, have launched a crowdfunding campaign to help with the Newton family’s expenses. A Norwegian lawmaker says she remembers having the suspect in the deadly New York City bike path terror attack as a driver last summer. Asunn Lyngedal, of the opposition Labor Party, says 29-year-old Sayfullo Saipov (sy-foo-LOH’ sah-YEE’-pawf) was her driver in July when she used Uber for a ride to the airport at the end of her New York vacation. Lyngedal said she thought he “was tired and overworked.” She added that Saipov talked a lot about his life in the U.S., had a wife and children and said he was tired because he drove a truck for his brother in addition to being an Uber driver. One of the two students injured in the deadly terror attack on a New York City bike path returned to classes the day after to keep his perfect attendance record. City Schools Chancellor Carmen Fariña says 17-year-old Noah Salz, of Brooklyn, was back at school on Wednesday, a day after being hurt when an Uzbek immigrant drove a rented truck down the West Side path, killing eight people and injuring 12. The injured include Salz, a 14-year-old girl and two adults who were on a school bus hit by the truck. The girl remains hospitalized. Farina says Salz told his mother he couldn’t miss school because he was working on his perfect attendance. When the teen’s bus didn’t show up Wednesday, his mother used a car service to bring him to school. This story has been corrected to show that Noah Salz did not attend Stuyvesant High School. The eight people killed in a truck driver’s rampage have been honored with a nighttime walk down the riverfront esplanade where the victims died as both investigators and terror-weary New Yorkers try to make sense of the crime. Some of the marchers carried candles Thursday night. Others pushed bicycles in solidary with the victims, who were cut down on a bike path that runs the length of Manhattan’s waterfront. The walk took place hours after the city began installing protective barriers along the path.